The time has finally come to reveal the secret project that I’ve been working on for the past two years. 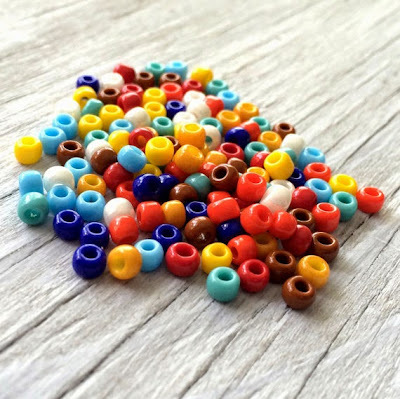 There have been many bead teasers along the way, and I’ve dropped a few hints about the purpose behind the exciting designs that have passed through my workspace. At last I can say that it’s all been for the production of my first beading book: Ancient Worlds, Modern Beads. I am very excited to present this collection of projects, all inspired by Ancient Egypt, Greece and Rome. Some of my all-time favorite designs are included with step-by-step instructions, along with oft-requested tutorials that will finally be available in full detail. 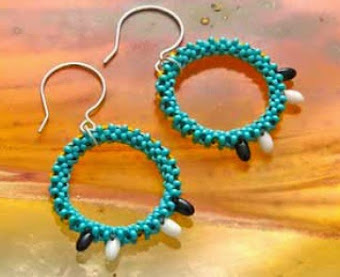 There are lots of collars, bracelets, necklaces and rings to make using seed beads, glass, and natural beads. I’ve also bent my metal rules just a bit to include 4 earring projects that coordinate with many of the other pieces in the book. It was a tough decision to make, but ultimately I wanted to create the best selection of projects possible - and there were just too many great earring inspirations to pass up! There are 30 projects in all – ten from each civilization. The projects are inspired by the culture, mythology, art and jewelry of the time. Many pieces recreate the look of actual ancient artifacts, while others capture an essence of each region and its legacy. The Egyptian projects were some of my favorites to create, of course. Greece and Rome offer up some pretty amazing inspirations of their own, and I can't wait to share them! It was incredibly fun to design each piece, and I hope that readers will love to recreate them as well. The book also includes some gorgeous handmade backgrounds, with textiles by Elaine Partington and glass by Matthew Durran. 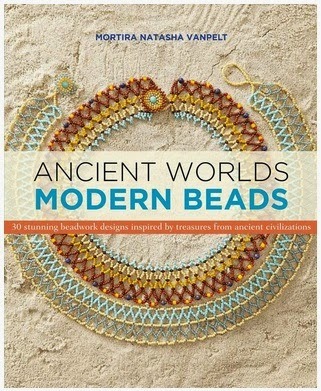 Ancient Worlds, Modern Beads will be published later this year by Barron's Educational Series. It is available now for pre-order from Indigo and Amazon. The official cover has not yet been revealed, and there are plenty of details still to come. I’m planning to release a full preview of all of the projects for you closer to release time. Meanwhile, I want to thank the creative team at Quarto for helping get this book off the ground, and for all of their hard work on bringing it together. I also want to extend some very special thanks to every Inspirational Beading reader for your patience and support during these two hectic years. 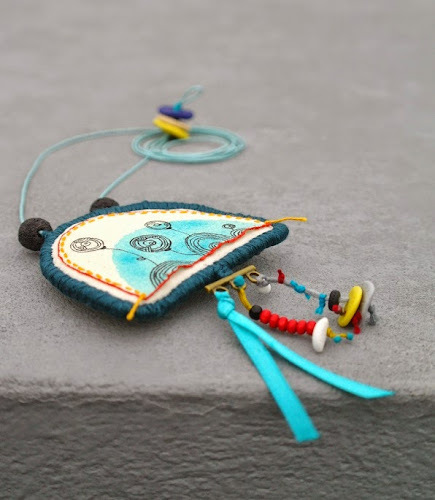 Being able to share my projects with you – if only as teasers – and reading your wonderful comments kept me going whenever I felt I couldn’t bead another stitch. Thank you for joining me here every week, and here’s to many more creative journeys! Following links to Amazon listings in this post may result in a commission for Inspirational Beading. Projects are chugging along on my bead tray once again, and it’s great to finally have a rhythm going. I’ve just finished up a tagua and St. Petersburg necklace that turned our rather nice with some summery yellow highlights. Now I’m about to cut into my hank of transparent ruby bugles and make a new cuff. I had planned on a new and interesting pattern for this bracelet, forgetting that I don’t have any opaque black bugles. I had to scrap the idea and I’m going to go with something simpler this time around. I’ve shelved the idea to use with another palette in the future. Next up I’m thinking of making a new rope and fringe necklace with a striped rope. I haven’t yet decided on accents, but a palette is forming and I’m sure I’ll be able to find just the right beads for the job. 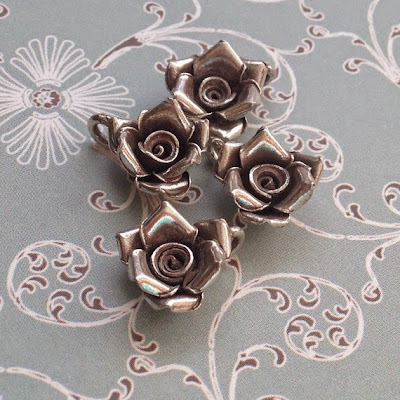 Making custom components and findings is an invaluable skill for any jewelry maker. By learning just a few basic techniques, you gain the advantage of having exactly the right pieces to make your dream designs, every time. Whether you like to string, weave, or wrap, custom findings allow you to personalize all of your designs, make perfectly matched sets - and of course, save money for more of your favorite materials. 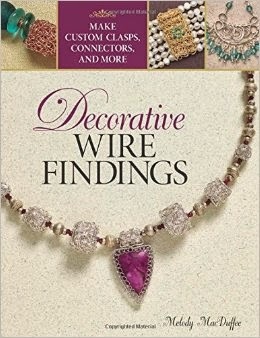 In her new book Decorative Wire Findings, jewelry artist and instructor Melody MacDuffee shares her favorite techniques for making one of a kind findings and components for amazing jewelry designs. The book includes instructions for more than 20 versatile essentials such as earring posts and backs, bezels for cabochons, and spacer bars for gorgeous multi-strand pieces. 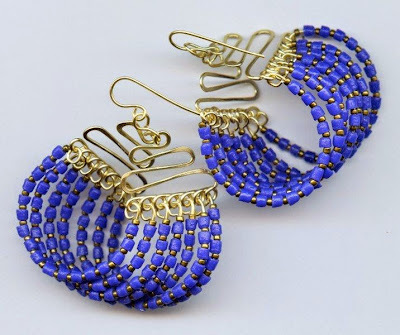 For inspiration and an in-depth look at how each component is used, there are 26 complete projects for earrings, bracelets and necklaces – plus ideas for unique rings and brooches. Many of the projects feature gorgeous beads from around the world, including Krobo beads created by artists at Soul of Somanya – an amazing non-profit co-founded and directed by Melody in Ghana, West Africa. There are also projects for fans of crystals, pearls and druzy stones – all of them a delight to new and experienced wire-wrappers alike. My personal favorite is an eleven strand bracelet made with stunning teal Krobo beads and golden spirals. With expert care, Melody guides readers through each of the projects; full color, step-by-step photos provide a look at how each design will progress. The materials lists include everything you need to complete a project, including page numbers for each of the components and findings that you’ll need to make ahead before completing a piece. Several projects offer instant gratification with just a few wraps and tweaks, while others provide an exciting challenge in gorgeous wire wrapping techniques. Never again find yourself without the right components for a project with the easy, professional-looking techniques in Decorative Wire Findings! Want to check it out for yourself? Melody and the kind folks at Kalmbach Books are giving away one copy of Decorative Wire Findings to an Inspirational Beading reader. For a chance to win, simply leave a comment on this post letting us know what your favorite jewelry components are! One lucky winner will be drawn on Tuesday, April 28th. Update: This giveaway draw has closed. I would like to thank Meloday MacDuffee and Kalmbach Books for giving me the opportunity to enjoy Decorative Wire Findings. Inspirational Beading has not received compensation for including products or publications in this post. This month’s bead giveaway has been drawn. Congratulations to our winner, and thank you so much for to everyone who entered! This month I asked about your favorite summer inspirations. Lauren had the winning comment, and she lists sunshine in the trees as the ultimate idea starter for summer designs. There is definitely something uplifting about viewing lush branches on a bright backdrop of blue sky, with plenty of light shining through. These bead picks capture the essence of those carefree summer moments. How do you like to capture the feeling of sunshine in your designs? There are some pretty exciting colors on my bead tray right now, as I finish up the first of my planned projects for using up some of my tagua slices. I had picked up a few shell charms to go with them last year, and now I’m very glad for the extra inspiration. The charm I chose for this necklace has a floral design, so I paired the purple up with creamsicle orange and turquoise for a bright spring look. I had planned to use cobalt blue for the third right angle weave chain, but discovered that I had plenty of cobalt iris, which almost perfectly matches that tagua and has a lustered finish that goes with the other seed beads. I’m also determined to finish up the emerald medallion with Toho triangles that my helper and I started months ago. Once that’s complete, my bead tray will be nice and tidy for more new projects. While counting all of my seed beads for inventory, I put aside all single packets of leftover Japanese rounds that I’m not likely to purchase again, and sorted them into palettes for color block cuffs. Can’t wait to get started! I haven’t been getting quite as much beading time in as I would like over the past few weeks, so I’ve spent some of my days off avoiding more tedious tasks and just stealing a little time with my beads. Rather than finishing up my inventory counts, I’ve finished and started two projects, and I’ve planned out a few more. Since I’ve just finished combing through most of my stash, I’ve got a lot of inspiration to work with this month. I’m most eager to work with these amazing transparent ruby bugles. The color is so delicious, like raspberry juice, and I think it will look fantastic with some cobalt blue in a new cuff. I was so pleased with the way the blue satin one turned out, I’ve been excited to make another, and this color is too good to pass up again. The only thing I have to decide is which color of Fireline will look best with the color and stitch. I’ve been amassing a small collection of coin beads over the last year or so, and I just had to move them to their own spot in my stash to accommodate the different styles and colors. I think the latest addition is these two-tone face beads, though they’ve been around so long I can’t remember. I did start a medallion with one, but it kept getting pushed to the back burner for other things. I’m looking forward to seeing what else they can do. 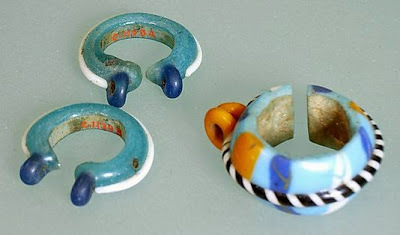 Finally, I re-discovered quite a few slices of tagua in my natural beads compartment and had to wonder why I’ve let them go unused for so long. I’ve got a long list of new pendant ideas to help cut them down a bit, although it might be tricky finding ways to use all of the purples. It's not a color I work with often, but the choices were limited when I bought these, and I was pretty obsessed with the style at the time. Hopefully some color inspirations will appear soon! 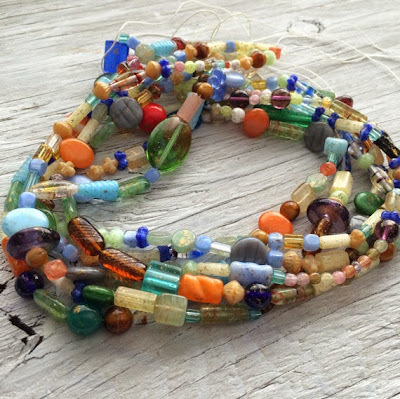 What kinds of beads are inspiring you right now? Summer is just around the corner, bringing with it some of nature’s most fabulous inspirations, like butterflies and trips to the beach. To celebrate, this month’s bead giveaway features two sets of vintage acrylic beads that are perfect for summer designs. The first batch includes an assortment of faux pearls and mother of pearl discs in shades of lustrous white and creamy pale orange. There are also a handful of Lucite pieces in creams and grays. This mix would be fabulous for mermaid inspired pieces! 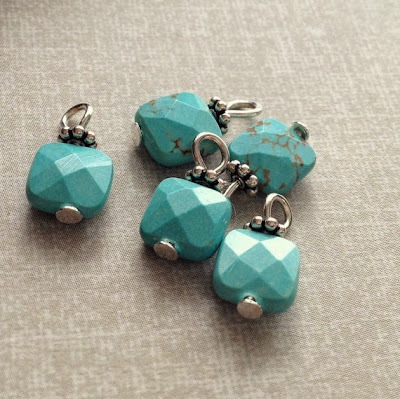 To complement the pretty pearls I’ve put together a collection of faceted button drops in aquamarine and pale aqua. The curvy shapes and transparent sparkle of these beads is so pretty – like tropical waters. 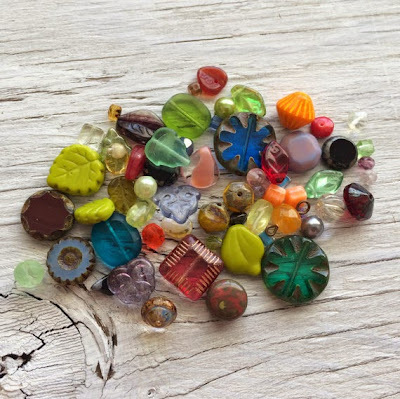 For a chance to win all of the beads shown, leave a comment on this post letting us know what your favorite summer inspirations are for jewelry design. One lucky winner will be drawn on Friday, April 17th. No log-in is required to enter, but all comments must be made directly on InspirationalBeading.blogspot.com to qualify. Please be sure to leave a contact method in your comment if you do not have a profile with email contact enabled. Incomplete or duplicate entries will not be entered into the draw. Update: This draw has closed. I’ve been away from my workspace quite a bit more than usual this week, with a new work schedule keeping me busy, but the new fringe necklace is coming along nicely. This is how my workspace looked yesterday, and since then I’ve added a button and finished off all the threads on the Montana blue right angle weave rope. Tonight, I’ll be adding the fringe, and I’m really looking forward to trying out the new style that I have in mind. I uncovered some new but forgotten shell charms in my stash while taking inventory, so I’m hoping to get at least one new tagua pendant on the go this weekend, if all goes well. Then I might follow a craving for some more bugles. As beaders, we’re all quite adept at stretching and surpassing the norms of jewelry design. 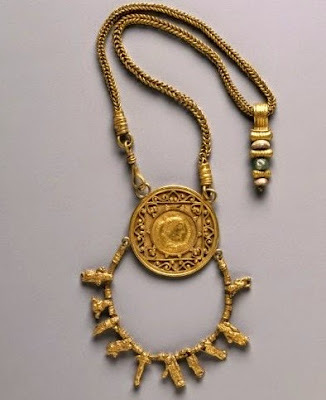 Our methods couldn’t be more different from the classical jewelry of the past. So it’s incredibly exciting to see an artist that takes these unique jewelry ideas even further with unexpected materials and styles. 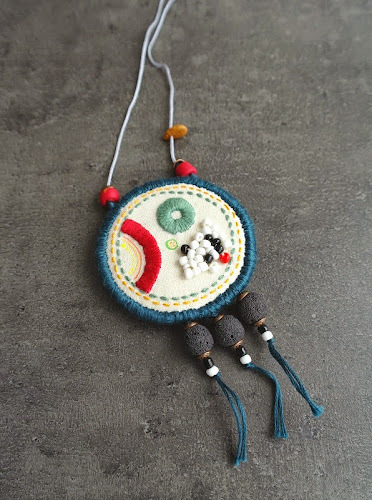 Today’s guest is Pera of Percee, an amazing shop where embroidery and polymer clay combine for gorgeous jewelry designs. 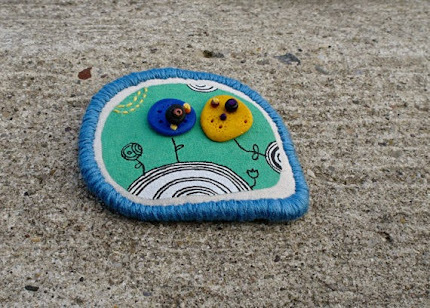 Inspirational Beading: When did you first get started with fabric and embroidery? 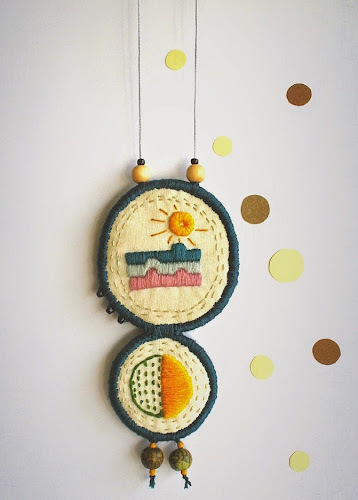 Pera: As a child, I've learned some embroidery basics from my mother. And shortly after that, I completely forgot about it and wasn't interested in it until pretty recently, about five years ago. First I started to make greeting cards with embroidered paper on them. And some day I spontaneously begun to embroider on little pieces of felt and some scrap fabric which I found in my home. And with that little pieces of embroidered fabric I was making bookmarks and then one day I just started to make brooches and necklaces. 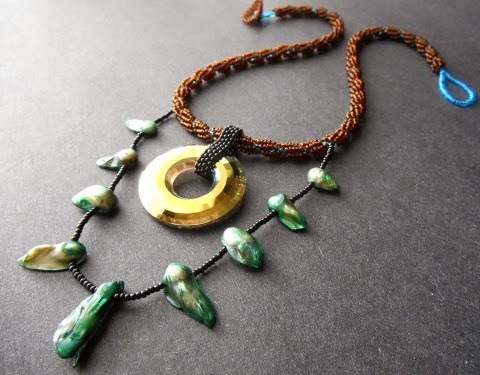 Inspirational Beading: Have you always been drawn to jewelry design as well? Pera:Not explicitly. I see a jewelry design as a way to make my drawings and my doodles an object with some purpose. I love to look and admire at various types of jewelry, but I rarely wear it. I don't know why, I love to wear it, but always somewhat forget to put it on. Inspirational Beading: Do you remember your first wearable piece? Where is it today? Pera:Yes, I remember. I remember that I was painting with acrylic paint and then just by coincidence I started to paint a tiny tree on a piece of dark grey felt. I don't know how, but I ended up making a brooch. That was 5 years ago and that was my first brooch and my first piece of jewelry. I was wearing it for about two years on my coat and now it is in my jewelry box. Pera:I love handmade beads. I love to make them out of the clay or polymer clay. And I love irregular and organic shapes. Also, I just love round beads, I adore circles. When making jewelry, I use small glass beads and wooden beads too. And my favorite fabrics are cotton and linen. Pera:An inspiration can be almost anything, I don’t have that special something, I think. All the different shapes and colors. And birds and flowers. Mostly I just look at the ideas in my mind taking shapes and becoming clearer and clearer. And I always carry with me a little sketchbook to write down various ideas and I just love to draw. So every time that I find myself waiting in various waiting rooms, I draw and often a parts of my drawings become motifs on my jewelry. Pera:I think that my design process is not much different than any others. But it is interesting and unique to me because I enjoy it so much. And most of the time I don't know how would my final piece look like and that is what's interesting to me. Pera:My favorite color is yellow and I must control myself to not use it too often. I remember when I was a little girl, almost all of my clothes were yellow. So, me and yellow have a special relationship all my life. Pera:I love to work with clay and making ceramics is something that I'm learning right now. I hope that I will be able to incorporate it in my jewelry soon. 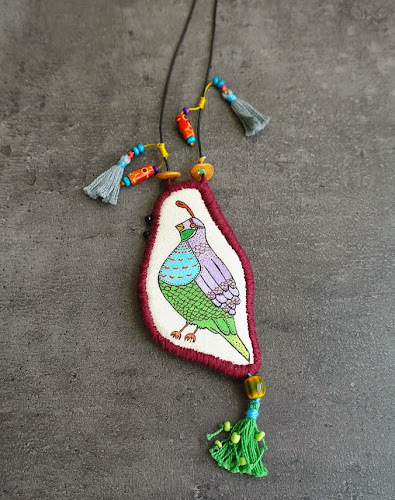 Pera:I think that it's a fabric bird necklace. I love birds so much. I love to look at their colors, their feathers and their eyes so much. And that necklace also has tassels, and I adore tassels. Pera:I would be happy to manage to inspire just anybody. I think that would be a great success. You can see more of Pera’s gorgeous jewelry at Percee on Etsy and on Facebook. For the latest designs and inspirations, follow along on Pinterest and Instagram. The curation of a bead shop selection is just as beautiful and inspiring as a carefully planned jewelry design. When all of the right elements are in place, you can’t help but feel excited about all of the possibilities. One shop that really stands out is All Things Beaded, with an amazing selection of Czech glass beads, buttons, and Hill Tribe Silver. 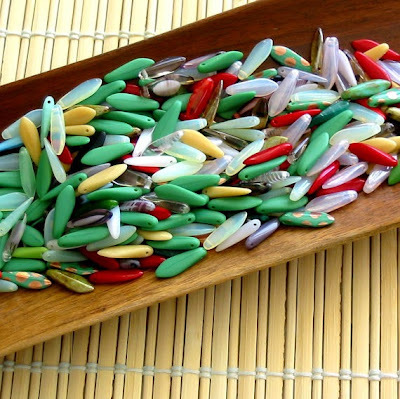 Today shop owner, Cindy, shares her bead story. Cindy:I started to unload some of my extra beads and found them to sell quickly. As a jewelry designer, I already had access to great wholesalers. It’s turned into a great business but it also allows me to buy more beads for my own designs while sharing my beads with people around the globe who also share my interests. I get a much better deal when I place larger orders and it also allows me to sell my beads at competitive prices. Sure, I am in this business to make money but it also very important to me that my customers pay fair prices. I really don’t believe in perceived value or what the market can bear. I have a pricing formula that I strictly adhere to. I’ve been told I can charge more but running an honest business yields more loyal customers in the long run. Cindy: I am absolutely smitten with Czech glass. A close second is Hill Tribe Silver. 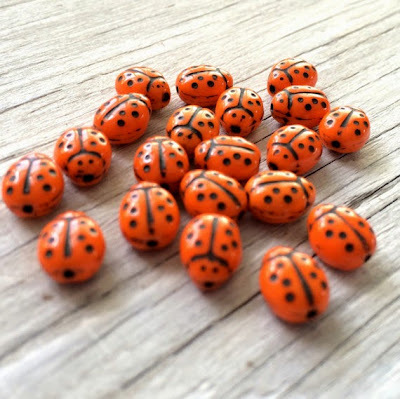 So many people sell Czech glass beads that they hardly seem unique, but they are! For starters, they have come a long way. Some are so beautifully finished that they often resemble gemstones without the inherent flaws that come with gemstones. Because Czech glass comes in such a variety of styles, shapes and colors each store that sells them brings a different variety to their customers. Karen Hill Tribe silver is near and dear to my heart. The fact that they are made by hand by a specific group of talented people give them an organic, heartfelt appeal. It’s as if part of their soul goes into each piece. I think this is why that comes across in any design where Hill Tribe Silver is included. Cindy: I try to sell what I use in my own designs. It makes the most sense. Why would I sell something that I have no interest in using? I also love to please my customers by ordering specific things they need. Often their suggestions and requests become some of my best sellers. I always listen and try my best to find what they need. I never cared for bead shops that simply say “no, we don’t carry that/those”. I can’t always find what they want but I will at least try. 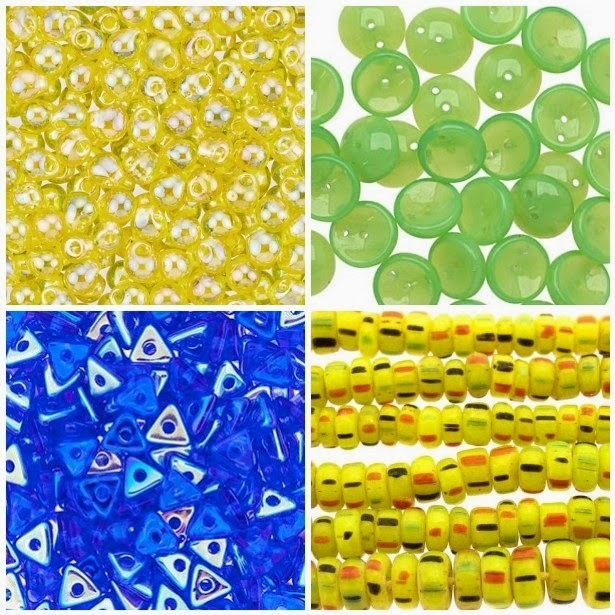 Inspirational Beading: What makes your bead selection stand out from other craft supplies shops? What's your favorite thing about your products? Cindy: I think it’s my variety and selection. 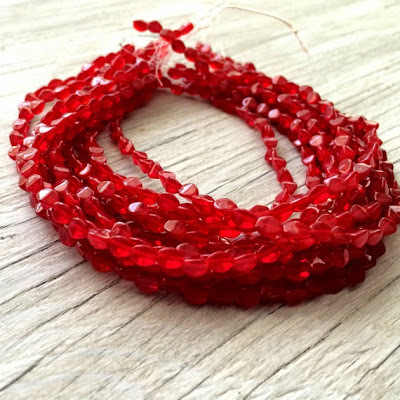 How can one be unique selling beads that are so readily available? It’s like reinventing the wheel. One thing I offer are mixes from my glass cookie jar filled with beads. I’m always adding to it. I fill my scoop with a random assortment and offer them for sale. It’s a great way to sample all my different beads. I find mixes like that also spur creativity. When I have a creative block myself, I will often pour a scoop on my work surface and go from there. Some of my favorite designs have come from that random mix. Cindy:The Spanish word for jewelry is joyeria. I think the first part of that word sums it up. Joy! To me it is one of the least utilized and underappreciated words in the dictionary. I feel joy when I receive an order of beads. Even if they are beads I’m simply restocking, I still get that feeling. I sit and ooh and ah over them every time. It never gets old. I get that same feeling of joy when I package up something a customer has purchased because I know how they are going to feel when they go to their mailbox to find my package. I usually drop my packages off after I pick up my kids from school. My daughter hands me the packages and loves to read where they are going. To think you can send packages to all corners of the earth and bring all those people the same universal feeling of joy is truly amazing. I think I really do this for the joy it brings. The money is an added by product of what I do. I can’t remember who said this but the quote “do something you love and you’ll never work a day in your life” really rings true. Cindy: For me, making necklaces is my favorite. It brings me back to my childhood where I’d spend lazy summer afternoons with friends stringing beads. At that time, there was no rhyme, reason or pattern. We just strung the beads, tied a knot, and wore them until the string eventually broke. Sometimes we used sewing thread because it’s all we had. Necklaces strung on sewing thread had short lives but we had the pleasure of picking them up and making a new necklace. Every time I make a necklace, it takes me back to that time. I like to see what others make with my Czech glass buttons. I assumed they were using them to accent a special garment or as a closure on a piece of jewelry. One of my regular customers makes earrings. It never occurred to me to make earrings with them. 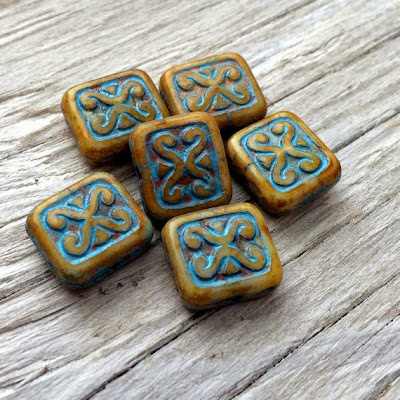 I decided to search on Pinterest for Czech glass buttons and the designs and pieces of jewelry made from them is nothing short of amazing. There are so many creative people in this world. Cindy: It really depends. For the most part it is baggies. I keep mostly all of my bead mix strands on the string. It showcases them better. All the rest go into baggies. When I receive an order, my mother counts them and puts them into baggies. For one, it speeds up my order fulfillment time. They are counted and bagged and ready to go when a customer orders them. 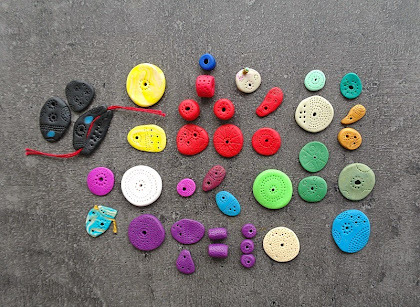 Secondly, bagging them up allows any chipped or broken beads to be discarded. When I buy beads to use for myself, I’m disappointed when more than 2 or three have chips or cracks. My mother and I try our best to weed out any misfits so my customers aren’t paying for something they can’t actually use. Cindy: I love connecting with my customers. I love the personal touch I can bring to the buying experience. Life can get crazy but I always try to ship quickly. It always amazes me how a larger company with a paid staff can take so long to get your products to you. I know my customers are excited to get what they have ordered. I know they can’t feel and touch it until it reaches them. I strive to minimize the agony of waiting. Cindy: Oh yes! I told myself at the beginning of the year that I have to go big or go home. As I complete this interview, I have a huge pile of beads and Hill Tribe silver on my desk. I have plans to expand my offerings to include more findings and chain so that my shop can become a one-stop shop for beaders and designers around the world. Of course, every new bead has to be counted, bagged, photographed and listed so it’s a time consuming process. My ultimate goal is to have thousands of items available for my lovely customers. To see more gorgeous bead selections, visit All Things Beaded on Etsy. For exclusive insights on new products and happenings, you can also sign up for the All Things Beaded Newsletter. 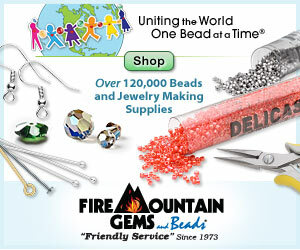 Inspirational Beading readers are invited to save 20% at All Things Beaded with coupon code BEADLOVER until May 31st. At last I’ve completed the blue bugle cuff and moved on to a new project. This week I’m getting started on using up some druk colors that I’ve had in my stash for far too long. Some of them have been around for years, never really getting used. Although a steady stream of jet black and turquoise have paraded through my stash, the purples, pinks and bright reds are starting to wear out their welcome. As I was finishing up the cuff, I pondered a few different ways that I could use these amethyst AB druks. In order to work around a color that doesn’t usually fit with my designs, I’d have to make them blend in with seed beads in just the right way. There aren’t enough for netting, and too many for lariat fringe, so I decided to go with a new rope fringe necklace. The design I imagined had longer, thicker fringe than my usual pieces, so I’m changing things up a bit. The Montana sapphire rope will be done in tubular right angle weave, which will produce a slightly daintier base than herringbone. I’m also going to add some layered fringe, though I haven’t quite worked out the perfect pattern yet.